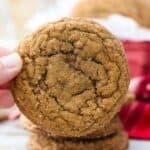 These chewy, Soft Molasses Cookies are just perfect! They are slightly crispy on the edges, chewy in the middle with a kick of ginger flavor and rolled in sugar for a sweet finish. Molasses Cookies are the perfect Christmas Cookies to share with you family and friends. In your stand mixer, combine the butter with the granulated and brown sugar and beat on medium speed until well creamed together. Add the molasses, eggs and vanilla extract. Mix into the butter and sugar until the eggs are well beaten. In a separate bowl, combine the dry ingredient. Slowly add into batter and beat on medium low speed until well combined and dough starts to form. Place the remaining ½ cup sugar in a bowl. Use a large cookie scoop (3 tbsp) and scoop cookie dough into sugar, roll around to coat the cookie. Place the cookies on a silicone lined baking sheet. Refrigerate dough for a minimum of 45 minutes and up to overnight. Preheat oven to 350° F. Place the cookies about 2 inches apart on your baking sheet. If your cookies have been refrigerated longer than 2 hours, allow them to rest at room temperature for 10 minutes before baking. Bake at 350° F for 10-12 minutes. Allow cookie to cool on the baking sheet for several minutes and then transfer to a wire rack to cool completely. Store in an airtight container.